The eCommerce industry is currently booming. In less than a decade, it has managed to cover various industries such as retail, real estate, pharma, and education. The retail eCommerce in India is expected to touch $45bn in 2021 from $20bn in 2017. 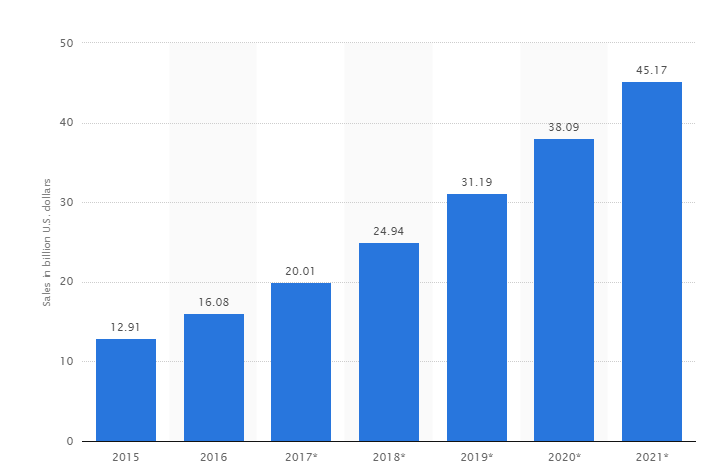 Speaking of global statistics, the B2C eCommerce sales is said to make $3.5tr in this year, and guess what? We are just three weeks away from ringing in the New Year. Consumers crazy for online shopping are in for a treat! But this also means they are spoiled for choice. One bad online buying experience can instigate them never to return to that eCommerce store. If you specialize in this industry in whatever capacity, you would be aware of Shopify. Did you know there are more than 500,000 businesses across 175 countries using the eCommerce platform? It also has an overall ranking of 10/10 as of March 2017. Do you run an eCommerce store? If yes, then you can relate to the pains of boosting conversions on a continuous basis. Since it is the holiday season, the pressure for segmenting your target audience, generating leads and driving maximum revenue is upon you. Popups can sometimes be annoying and make it difficult for the website visitors to go where they want to go. Therefore, instead of installing a popup that arrives on the page right at the beginning or while browsing, you can apply exit intent. It is the popup that shows when the visitor’s mouse leaves the browser window. Yup – the one that comes right when you are about to leave the webpage. What better way to pull back visitors with a discount or a coupon code when they are leaving your eCommerce store? Exit-Intent technology can help you understand your audience behavior better, and optimize the browsing experience for them. This means you will be able to boost on-site revenue, recover abandoned carts, increase social media following and upsurge email subscription rates. They say live chat is the ultimate sales hack. Forrester reports Wells Fargo saw a double-digit increase in conversions after they added this feature on the website. Tools such as Olark, LivePerson, BoldChat and Kayako have made it possible for eCommerce stores to bank on the potential of live chats. Don’t use offline chat as it is rude and disappointing. If people see a chat box, they want to chat. Did you know 50-60% of leads come through after-hours (Kissmetrics)? If you can’t employ a customer care rep for this task 24/7, drop this idea. Answer within 15 seconds. If it takes the rep longer than that, the potential customer is already long gone! Check out your traffic insights. Are you targeting the right set of people? What are the top 5 questions asked? These might be worth taking a look. Facebook is revolutionizing the online shopping experience. No, seriously. It is! You will be surprised to know that Facebook has the highest conversion rate. Therefore, it is high time your eCommerce store put FB messenger to good use! The platform can help you inform your customers about an ongoing sale or time-bound coupon codes and instigate them to buy something from you quickly. Since you would already have the customer’s browsing and purchase history along with location, you can make appropriate suggestions. The Facebook messenger can act as a virtual shopping assistant and can help your buyer pick out the right choice. If not that, you can deliver shipping notifications via the platform. Did you know you can lose as many as 15% of your customers if you ignore their requests on social media? And businesses that do respond to social queries can grow by 20-40%! For immediate assistance, Facebook Messenger Marketing is perfect! It’s not a surprise that businesses have seen a 33% increase in the conversions of cart-abandoning customers, and a 29% better engagement with personalized notifications. Mr. Button, an eCommerce store for men, uses the push strategy to engage with their customers as per their location. Their notifications nudge the subscriber to hit the store given that he is just 2kms away from it. Reduce cart abandonment rates, keep the customers informed and give them a reason to shop (of new product arrivals, shipping details, discounts, price dips, etc.) with the push. As an eCommerce owner, you have to continuously find ways to amp up your conversions. Push is certainly a tried and tested marketing tactic. Owing to the ease of creating an online store on Shopify, we see a new one getting launched every day. It only goes to say that the competition isn’t decreasing. That’s why it is time to start focusing on the sales for your next year, starting today. Any other tips and tricks that you would suggest to our Shopify users?